EPA Administrator Scott Pruitt testifies before a Senate Appropriations subcommittee on the Interior, Environment, and Related Agencies on budget on Capitol Hill in Washington, May 16, 2018. Embattled Environmental Protection Agency chief Scott Pruitt said he doesn't remember asking his security detail to use lights and sirens to speed his government-owned SUV through Washington traffic, even as Democratic senators disclosed an internal email saying he did. The email, written by then-EPA special agent Pasquale "Nino" Perrotta just days after Pruitt's confirmation in February 2017, has the subject line "Lights and Sirens" and added "Btw - Administrator encourages the use." Pruitt later promoted Perrotta to lead his personal protective detail. Former EPA officials have told The Associated Press that Pruitt made the change after Perrotta's predecessor refused to use lights and sirens in non-emergency situations, such as when the administrator was running late for dinner reservations or going to the airport. Ranking Member Sen. Tom Udall, D-New Mexico, questions EPA Administrator Scott Pruitt as he testifies before a Senate Appropriations subcommittee on Capitol Hill in Washington, May 16, 2018. 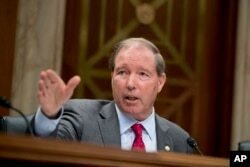 Under sharp questioning by Sen. Tom Udall of New Mexico, the top Democrat on a Senate appropriations subcommittee that prodded Pruitt on Wednesday, the EPA chief denied making the request. "I don't recall that happening," Pruitt said, adding that he was confident his security team followed the applicable policies. The hearing was the toughest grilling Pruitt has yet faced about ethical issues, ranging from his use of taxpayer money to fly first class to outsized spending on his personal security. Time and again, Pruitt responded by claiming he either couldn't recall details or was unaware of decisions made by some of his closest aides. The questioning was notably more aggressive than during appearances Pruitt made before House subcommittees last month, during which the Republican chairman repeatedly cut off Democrats the moment their limited time expired and allowed Pruitt not to answer. In contrast, Chairwoman Lisa Murkowski of Alaska gave the Democrats freedom to press Pruitt and ask prosecutor-style follow-up questions when Pruitt, a lawyer who previously served as Oklahoma's state attorney general, sought to deflect or give non-specific answers. Murkowski set the tone from the start, opening the hearing by expressing concern that allegations over Pruitt's missteps are overshadowing the Trump administration's pro-business regulatory rollbacks. "I'm being asked, really constantly asked, to comment on security and on housing and on travel. I'm reading about your interactions with representatives of the industries that you regulate" Murkowski told Pruitt at a hearing normally expected to focus on budget matters. Udall, a lawyer who like Pruitt previously served as the attorney general of his home state, led the charge for the Democrats. He began by citing the Government Accountability Office's recent finding that EPA's purchase of a $43,000 private office booth for telephone calls broke federal law because the agency failed to notify Congress in advance of an expenditure exceeding a $5,000 cap on spending for office renovations. Udall accused Pruitt of continuing to flout legal requirements to inform lawmakers about that and other big-ticket spending, and "treating your position of public trust as a golden ticket for extravagant travel and fine dining." 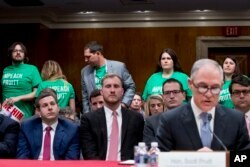 Members of the audience wear shirts that read "Impeach Pruitt" as EPA Administrator Scott Pruitt, right, testifies before a Senate Appropriations subcommittee on budget on Capitol Hill in Washington, May 16, 2018. EPA's inspector general revealed earlier this week that Pruitt requested and received 24-hour security beginning his first day in office. That challenges Pruitt's account that the round-the-clock security was a result of threats against him after taking office. On Wednesday, Pruitt repeatedly dodged directly answering whether he requested the stepped-up security coverage, saying career EPA officials below him made the final decision. Pruitt's preoccupation with his safety came at a steep cost to taxpayers, as his swollen security detail blew through overtime budgets and at times diverted officers away from investigating environmental crimes. Altogether, the agency has spent about $3 million on Pruitt's 20-member full-time security detail, which is more than three times the size of his predecessor's part-time security contingent. Despite the mounting investigations into Pruitt's actions, President Donald Trump has said he still supports his EPA chief. Asked Friday if he still had confidence in Pruitt, Trump told reporters, "I do." Perrotta, who wrote the email about the use of lights and sirens, also drafted a memo last year saying Pruitt needed to fly in premium class seats because of security threats. The security chief recently took early retirement from EPA amid questions about whether he improperly recommended a business partner for a government contract and outside work he performed as a private investigator for a tabloid newspaper. 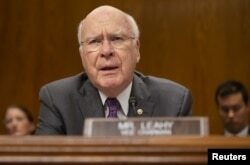 Sen. Patrick Leahy (D-Vermont) makes an opening statement before EPA Administrator Scott Pruitt testifies before a Senate Appropriations Interior, Environment, and Related Agencies Subcommittee hearing, Washington, May 16, 2018. Democratic Sen. Patrick Leahy of Vermont told Pruitt he was a walking example of "ego run amok," calling him an embarrassment to the agency he leads. The senior senator called "silly" Pruitt's claims he needed to fly in first class after unpleasant interactions with other travelers. "Nobody even knows who you are," Leahy told Pruitt, who sat stone faced before him. "We want environmental protections that work. Forget about your own ego and your first class travel and your special phone booths that just make you a laughingstock and your agency a laughingstock." As Pruitt left the hearing room, protesters trailed him through the halls of the Senate office building shouting "Mr. Pruitt, you should be fired!" and "You should be ashamed, Mr. Pruitt." The EPA chief, ringed by his aides and security personnel, appeared to ignore them. He briskly made his way out to a waiting black SUV with tinted windows before driving away.